Here is a photo of a storm at sea off the coast of Tamarindo. This is late afternoon, as the sun is backlighting the clouds that have rolled in over the Pacific. We do not get hurricanes in Tamarindo. Hurricanes from the Caribbean do not cross the tall spine of mountains that run through the central part of Costa Rica. Even the Caribbean side of Costa Rica is south of the hurricane zone. The weather in Tamarindo is sunny and clear, with virtually no rain, from November until April. I do not mind the occasional tropical downpour during the summer months, as they turn everything lush and green, and are usually brief. They also add drama to the sea and sky, as this photo shows. This week we are showing some photos of the architectural details of London on our Viva la Voyage travel photo site. Here is a photo of 6 iguanas in one picture frame. This is very unusual. It is common to see one, maybe two iguanas, but this is the only time I have seen such a large grouping of iguanas together. In this photo you can see that iguanas have claws. That is one of the features that differentiates iguanas from geckos. Geckos have little round pads at the end of their toes. Geckos usually come out at night, whereas iguanas come out during the day. I took this photo in Palo Verde National Park. In December, the male iguanas will turn orange to attract a mate. Here is a close up photo of the iguana on the beach that I showed yesterday. He has classic green banded coloration and you can see his individual scales in this photo. Iguanas do not bother people. They are still most of the time. They are usually hanging out on tree branches and most people do not even notice them. They walk slowly. They will not approach close to a person. If a person walks too close to them, they will scurry off when the person gets about 2 meters, or 6 feet away. For this photo, I knelt down close the the level of the sand and it still did not bother him. Tomorrow, I will show you an iguana "convention." Yesterday I mentioned that Costa Rican President Laura Chinchilla was in New York last week for the opening of the U.N. General Assembly. I should have mentioned that the Costa Rican delegation joined the USA in walking out when Iranian leader Mahmoud Ahmadinejad gave his inflammatory and insulting speech. Also, President Chinchilla was interviewed by Rick Sanchez of CNN, who asked her to comment about the negative impression that Americans have of Latin America. She answered, quite accurate, that Costa Rica is different. It is a stable democracy, with no military, that welcomes U.S. investments, and that is a leader in the protection of the environment. Indeed, I find that Costa Rica has a wonderful reputation among Americans. The question failed to recognize the diversity of Latin America. I have shown some photos recently of dogs and children on Langosta Beach. But this is Costa Rica, after all, so there are also iguanas on the beach. This iguana was on the same stretch of beach where the woman and her dog were playing in the photos that I have shown during the last few days. Here is a news item that is unrelated to today's photo, but I thought I would share the news that Costa Rica's President, Laura Chinchilla, spent all of last week in New York for the opening of the General Assembly. She gave a speech at the U.N. and she also rang the opening bell at the beginning of the day at the New York Stock Exchange. She gave a short talk to the stock traders about the economic climate in Costa Rica that welcomed foreign investment, including the fact that the important Moody's investment service has recently increased its rating of Costa Rica. This is the last in my series of photos of the woman and the dog playing while on a walk along Langosta Beach. The dog has dutifully brought the stick back to the woman, and she is teasing the dog by looking as if she does not know where the stick is. The dog is not fooled. He or she knows better. Today is Sunday, so we have new photos posted on our Viva la Voyage travel photo site. This week we are posting photos of some of the architectural details of London, England. By throwing the stick into the ocean rather than on the beach, the dog has the pleasure of cooling off in the water as he gets his exercise. I would think that it is more pleasant for the dog to pick up a wet stick rather than a sandy stick. Please check out our photos of the gardens of the Villa Monestero on the shores of Lake Como, Italy, on our Viva la Voyage travel photo site. It is a special place. The woman in this photo would often throw the stick out into the ocean, which suited this yellow labrador retriever just fine to plunge into the waves to get the stick. Labs love the water. When my sons were young, we had a yellow lab named Tortilla. She loved the water and loved to fetch tennis balls and chase birds in the back yard. I presume that this woman lives in the area, although most people who walk Langosta Beach are tourists. Most tourists do not bring their dogs with them on vacation, of course. Here is the next stage of the woman's play with her dog. The stick has just left her hand, and the dog is already starting to react, pushing off the soft sand to dash in the direction of her throw. I am sure that there are baseball managers and fans who with that the outfielders on their teams could be as fast to react to the direction and trajectory of a ball flying off a bat as this dog is to dash in the direction of the flight of the stick. Yesterday I showed a little girl playing with a stick. Today I begin a series of a young woman and her dog playing with stick. This photo shows a woman with her yellow labrador retriever. The dog and master are both very well trained by each other. The dog is poised, with anticipation and concentration, and the woman directing him to stay still, as she hides the stick and is about to throw it. I will continue this series tomorrow. Hey! I've got a stick! This girl in yesterday's photo was too little to play with her sister and the giant beach ball, but that did not stop her from having something with which to play. She found some driftwood that attracted her, and here is a photo of her holding it up for her sister and mother to admire. Tomorrow I will show you more play on the beach with a stick, except It involves an animal that you would expect to be playing with a stick. The little sister of the girl I showed yesterday was not able to play with the giant beach ball, as the ball was larger than she is. That did not stop the little girl from enjoying her time at the beach and having something with which to play. I will show you more of this little series tomorrow. If you did not check out our photos of the gardens of the Villa Monestero on the shores of Lake Como, Italy, yesterday, I invite you to do so today on our Viva la Voyage travel photo site. it is a special place. Girl playing with large beach ball. Judging from some of the comments on this site, which I appreciate, people seem to like photos of children on the beach. Here is a photo of a girl playing with a large beach ball on Playa Langosta, near our condo. This girl was kicking he ball back and forth to her mother. Tomorrow I will show you her little sister. Today is Sunday, so we have new photos posted on our Viva la Voyage travel photo site. This week we have a treat for you. Come join us for a walk through the gardens of the Villa Monastero in Varenna, on the shores of Lake Como, Italy. I haven't shown beach photos in a little while, so I will return to the beach with this photo of a dog enjoying playing in the surf. This dog looks alert and healthy. In about a week I will show a series of photos of a young woman who was throwing a stick to her yellow labrador retriever along the beach. I enjoy watching the dogs, people (especially children), iguanas, surf and sky along the beach. We are showing photos of the architecture of Santa Fe, New Mexico on our Viva la Voyagetravel photo site this week. This is the courtyard of the condos across the street from our Langosta Beach condo. It is a pleasant environment of lush landscaping and fountains. These condos are not right on the ocean so the owners or guests do not get a view of the beach and waves from their condos, which we really enjoy, but they have a very tranquil courtyard and they are a very short walk across the street and on a little path beside our condo to reach the beach. Like many places in the world, developers in Costa Rica built too many condos during the real estate boom that collapsed several years ago. Quality projects, like this one and like the buildings where are condos are located, have continued to be successful, whereas projects that were not well planned or located have suffered. In future weeks I will show some examples of unsuccessful projects up in the hills in some of the other beach communities. We are showing photos of the architecture of Santa Fe, New Mexico on our Viva la Voyage travel photo site this week. Here is the other side of the same bread truck that I showed yesterday. This is a photo of Arenal volcano. It is an active volcano that erupts most of the time. This photo was taken on a very clear day. Some of the people who rent one of our two condos in Tamarindo also stay for a couple of days in the Arenal area so they can see the volcano and enjoy the activities in that area, which is about 3 or 4 hours away by car. I have shown some photos of Arenal on this website in the past, which you can see by clicking on the "Arenal" index link in the margin of this website. This is a photo of the National Theater in San Jose, Costa Rica. Was I there? No. I took this photo of the side of a Bimbo bread truck making a delivery at a convenience market in Tamarindo. The National Theater is the most magnificent building in the country. It is as elegant on the interior as it looks from this photo of its exterior. It is a source of national pride, as it should be. Consider that it was built in the 1890's when the population of San Jose, the capitol, was less than 20,000 people! How did such a small country and small city build such a magnificent building more than a century ago? Costa Rica paid for the building by putting a tax on coffee exports. So for everyone around the world whose great grandparents drank coffee in the 1890's, thank you. This gives me an opportunity to tell you something quaint about Costa Rica that shows its transition from a developing country. The country does not use street addresses and only now is it implementing street addresses in San Jose, even though its capitol now has more than 1 million people. Without addresses, how do people know how to find places? Everyone simply gives directions from someplace that everyone knows the location. For example, the "address" for the French Embassy would be "behind the National Theater" because everyone knows the location of the theater. The Tico Times newspaper recently had an article about how in the future places like the Mercedes Benz dealership will be able to give a street number for their location, rather than saying "800 meters from the traffic circle near the multi-store mall." The newspaper commented than San Jose is a big city and needs addresses with numbers, unlike the villages of Costa Rica where everyone still knows where everything is. The cost of adding numbers to buildings in San Jose will be paid for in large part by the Banco de Costa Rica because the bank will be allowed to put its logo on the building and house number signs. You may have noticed that when I described the location of the new Italian restaurant in Tamarindo two days ago, I said it was across from the Century 21 office. That is the traditional way to give the location of a place in Costa Rica. Everyone in Tamarindo knows where the Century 21 office is. Maybe one day we will be able to give an address for our condo in Langosta, but until then, if we say it is on the beach road a block from the Barcelo Resort, that is the Tico way to give the equivalent of an address. Here is the menu of El Lugarcito, the new Italian restaurant that I showed yesterday. 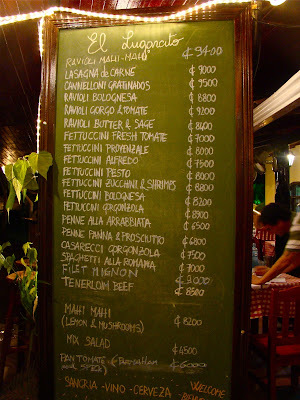 Like many restaurants in Tamarindo, it is (1) owned by a European, and (2) has a menu that is written on a chalk board. They feature, fresh, home made pasta. I love Italy and Italian food. (I have been to Italy 7 times.) A few months ago a group of 13 family and friends and I did a pasta cooking lesson in Varenna, Itally, on the shores of Lake Como. It was so much fun. After making home made pasta, I certainly have a better appreciation for the skill and effort that goes into preparing such an extensive menu of fresh pasta each day. The prices on this menu are in Colones, although many restaurants in Tamarindo have menus in dollars, and all will accept U.S. dollars. There are about 550 Colones to 1 dollar, so most of these dinners cost about $12 or so. I ordered the lasagna, which I loved, and my brother-in-law loved his dinner as well and wanted to go back on his last evening in Tamarindo. This week we are showing photos of the architecture of Santa Fe, New Mexico on our Viva la Voyage travel photo site. This is a photo of a new Italian rstaurant in Tamarindo. It is called El Lugarcito, which means "small place" in Italian. The owner is a charming and friendly man named Zeno. He is from Torino, or Turin, Italy. He was named after Saint Zeno, or the Basilica San Zemo, the large church in Verona, Italy. I have never been to Turin, but I have been to the Basilica San Zemo in Verona. It is beautiful. El Lugarcito is a classic Italian trattoria. It is encouraging to see new restaurants opening in Tamarindo, as it can be a challenging economic climate for restaurants during the worldwide recession. This new restaurant is just off the main beach road, across from the Century 21 real estate office, in the heart of Tamarindo. 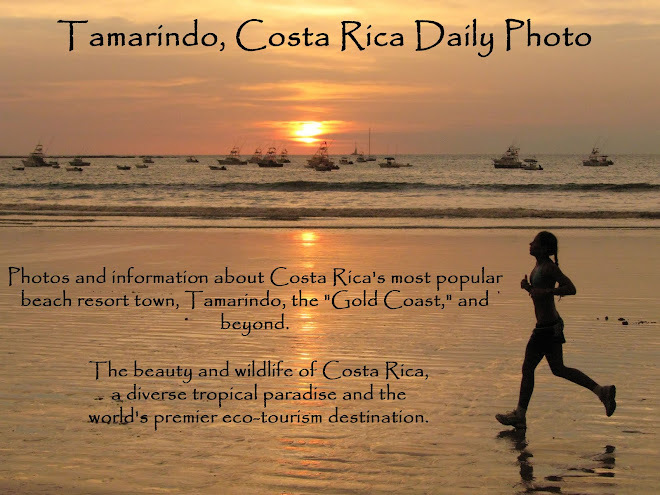 It is less than a block from our condo at the Tamarindo Diria Resort. Tomorrow I will show you the menu and the food. Today is my wife's birthday. Please drop by her Scottsdale (Arizona) Daily Photo site to join me in wishing her a happy birthday. Yesterday I showed the two ladies who operate a massage business under a tree on the beach just below our Langosta condo. It is a convenience and luxury to have massages right on the beach, but it means that the ladies have to carry all of their massage tables and supplies down to the beach from the street and back every day. Here is a photo of one of the masseuses carrying a massage table up from the beach. I guess all of the massages that she gives keeps her arms strong enough to carry such a big load. I hope she makes a good living giving massages on the beach. Langosta Beach is not very crowded because it is a residential area. People do take walks up and down the beach, so hopefully there are enough people renting condos in the area or staying at the Barcelo Resort, which is about a block away, to give them enough massage business. Today is Sunday, so we have new photos on our Viva la Voyage travel photo site. This week we are showing photos of the architecture of Santa Fe, New Mexico. Meet Esmerelda and Alejandra, the two masseuses who provide massages on the beach right below our Langosta condo. I have had a massage there and can testify that they are very good. They have selected a place that is protected by some trees, right next to the ocean, so there is some privacy. People walking along the beach cannot really see the massages unless they walk right into the tree shaded area. The massages on the beach are $40 USD for one hour, which is a fraction of what massages cost in the USA. The location right on the beach provides a relaxing setting for a massage, with the sound of the waves and the ocean breezes. There is another location for massages on Tamarindo beach. We are showing photos of the birds, bats and bridge of Sydney, Australia, this week on our Viva la Voyage travel photo site. Yesterday I showed a photo of parents carrying a baby and lots of baby stuff on the beach, and I suggested that perhaps they were ready for a nap. I think I now have a better idea. After carrying all of that stuff on the beach, or perhaps after a vigorous session of surfing, why not stop by this location on Langosta Beach for a massage. Fortunately, this sign is located right by our Playa Langosta condo. Tomorrow, I will show more of the massages on the beach. This week we are showing photos of the birds, bats and bridge of Sydney, Australia, on our Viva la Voyage travel photo site. During the last few days I have shown some photos of small children on the beach. Here is another, this one of the two parents carrying a baby and the very large amount of stuff they took to the beach to accommodate the baby. When I travel, it impresses me how parents of infants and small children these days carry so much stuff. Strollers, car seats, diaper bags, stuffed animals, toys, electronic games, etc. When this mom and dad return from the beach to where ever they are staying, I think the baby, mom and dad will all be tired and ready for a nap. We are showing photos of the birds, ridge and bats of Sydney, Australia this week on our Viva la Voyage travel photo site. I received some nice comments yesterday from people who enjoyed the photo of the small child playing in a tide pool on the beach. Here is another photo of a child and his father playing in the sand. I don't know who is enjoying the simplicity and relaxation of the moment more. Like yesterday's photo, this was taken on Langosta Beach. This week on our Viva la Voyage travel photo site we are showing photos of the birds, bridge and bats of Sydney, Australia. What could be more adorable than a small child enjoying a day at the beach? The child in this photo was sitting in a tide pool in Langosta beach, enjoying the simplicity of life and seemingly not having a care in the world. We are showing photos of the birds, bridge and bas of Sydney, Australia this week on our Viva la Voyage travel photo site. I have not shown photos of the beach lately, and Tamarindo is a beach resort town, so I will catch up with some photos of the beach and ocean. This is a photo of Tamarindo beach and bay, looking north to Cabo Velas. This is from the south end of the beach, which is protected from waves by San Francisco point and island. You can see how gradual the slope of the beach is, as there are some people way out in this photo at low tide. This photo also illustrates the difference between the weather during the "green season" compared to the November - April dry season. I took this photo a few weeks ago, and you can see the soft layer of clouds. During the high tourist season of December - March, it is usually clear, sunny and warm. The variable clouds, as shown here, during the summer vacation months for tourists makes it a little cooler. We are showing photos this week of the birds, bridge and bats of Sydney, Austrialia on our Viva la Voyage travel photo site. This photo shows the beauty and artistry of Chrotega Pottery. Some artisans make reproductions of pre-Columbian designs. Others have modified the styles to appeal to the tastes of tourists. The clay and locally available materials feature earth tones, as you can see in this photo. The designs use both geometric and animal motifs. This is the last photo in my series on Chorotega pottery and the Ecomuseuo de la Ceramica Chorotega in the village of San Vicente. It is a great place to buy pottery. It is a convenient stop after taking a wildlife river trip in Palo Verde National Park. Here is a link to the website for the ceramics museum. Today is Sunday, so we have new photos on our Viva la Voyage travel photo site. This week we are showing photos of the birds, bridge and bats of Sydney, Australia. This is a closer view of the oven shown in the photo yesterday. The artisans build a wood fire inside the oven to bake the pottery. With the local clay and a wood burning oven, the ceramics are not as strong as the modern ceramics and china that is fired in a high temperature kiln. Here is a link to the website for the Ecomuseo de la Cermica Chorotega. This week we are showing photos of a remote area of Aututaki in the Cook Islands of the South Pacific on our Viva la Voyage travel photo site. This is the garden area and oven behind the the Ecomuseuo de la Ceramica Chorotega. They have demonstrations showing how they make the pottery, and they also grow traditional herbs. Here is a link to the website for the ceramics museum. San Vicente is a very small village, and I think it is great that they have a museum to display the traditions, and to help offer a market for the work fo the artisans. The museum opened in 2006. It is affiliated with the Museo Nacional de Costa Rica. Many of the guide books will mention the pottery village of Guaitil a mile or so away, but they do not always include the smaller village of San Vicente or this fairly new ceramics museum. This photo shows a display of Chorotega pottery in the Ecomuseo de la Ceramica Chorotega in San Vicente. Costa Rica does not have a lot of pre-Columbian art because the native population was almost wiped out by the Spanish during colonial times. Chorotega pottery is a pre-Columbian tradition that survives in the villages of San Vicente and Guaitil. It is possible to buy the pottery directly from the artisans. It is also possible to buy this pottery in shops in Tamarindo and other tourist areas. In Tamarindo, there are even street vendors who will walk the beach and offer pottery, although fortunately they are polite and not aggressive like vendors in some countries. Yesterday Sharon of Phoenix Daily Photo asked if we bought much pottery at the museum. I bought more than 20 items. We will use them for gifts for the colleagues who work for us in our office in Arizona. I hope none of them will read this post, as now it won't be a surprise. Here is a link to the website for the ceramics museum. Today's first-day-of-the Month worldwide Daily Photo Theme is open air markets. I am bending the rules a little bit, as this market is partly open air and partly under a roof, but I want to share with you a delightful museum and market. This is the market area of the Ecomuseo de la Ceramica Chorotega, located in the town of San Vicente, a little down the road from the pottery village of Guaitil. It is like an open air market, as they display the pottery of local artisans around a large room that also has museum displays, with a garden and oven for making pottery out back. Many of the pottery artisans in San Vicente and Guaitil sell pottery in open air market areas in the front of their homes where they make their pottery. These are the women who work in the museum and pottery market. They obviously are friendly, enjoy their work, and are proud that they are helping to carry on the pre-Columbian traditions of Chotoga pottery. I will show more of it during the next few days. Here is a link to the website for the museum.